There’s been some interesting negative reactions to open data lately. I’m all for skepticism, but skepticism should be backed up with facts. For instance, when Michael Gurstein talks about the digital divide he refers to concrete examples of this coming true — although I disagree with some of his analysis (more on that in my book). Andrea Di Maio’s critique of open government data, on the other hand, is too vague to be instructive. I readily admit that “open government” and “open data” is vague already. Justin Grimes, Harlan Yu, and I held a panel at Transparency Camp a few weeks back about how vague the terms are and how that can lead to trouble when we aren’t clear about what we mean. Di Maio runs right into this problem, placing the burden of a successful open data movement on “mythical ‘application developers'” (sorry, I don’t exist?). Transparency is only one of a dozen or more reasons why open government data is a good thing, and these reasons cannot all be judged by the same rubric. Focusing on open data for transparency, Di Maio argues that “[t]he more the data, . . . the more specialized are the skills and resources required to process that data,” or in other words that open data can actually exacerbate a digital divide rather than close it. I’ll be one of the first to say that open data doesn’t necessarily mean better government (see the link to my book above), but Di Maio’s statement that I quoted can easily seen to be simply wrong. One has to evaluate open gov data with everything else held equal. in other words, if there is open government data in the hypothetical, the comparison to make is to another world where the same government processes exist — they’re just not published in a machine-processable format. Now, you tell me, which world requires more skill to understand the data? Clearly the second, because every skill you need in the open-data-enabled world you need in the open-data-denied world, but you *also* need some other skills just to get the information in the second world. There are certainly unintended consequences of open data. In my book I discuss two cases where legislative data affected the behaviors of the legislators in a way that’s probably not good. But let’s stay on fact and, for that matter, on logic. As a web developer who likes to produce info graphics, I’ve often run into the problem of choosing good color palettes for charts and, in the harder case, a smooth color spectrum. Colors should be aesthetically pleasing and able to convey differences in accordance with our perceptual abilities. UPDATE 1: Jan 9, 2011: I made a number of mistakes the first time around, including having the diagrams flipped. Until today I didn’t really understand the mechanics of color blindness and so it was difficult to understand how to choose good color spectra. Worse, the only simple guide I could find through Googling gave some examples of good color palettes to use without explanation and without relation to the various types of color blindness. Here’s what I’ve learned this afternoon. Now let’s make this practical. For a web designer concerned about accessibility, avoid following radial lines! More on this in a moment. Let’s start with protanopia, the lack of “red” cones, as an example. The image below plots in the dark dotted lines the confusion lines for protanopia on the CIE LAB color space. Note that because CIE LAB space is a distortion of the CIE 1931 space, the confusion lines no longer appear to radiate from a point. (This color space has a third dimension for lightness, L in 0-100, not shown. Here I’m choosing L=50.) For a “normal”-sighted individual, any path through the color space will be perceptually useful for a chart. For a protanopic, only paths that go perpendicular to the confusion lines will have maximal perceptible differences. If you follow confusion lines, the protanopic will not be able to tell the difference. As you can tell, going from red to green is not a good idea since it follows a confusion line. The perpendiculars are indicated by white arrows. Good gradients follow the perpendiculars. As you can see, “red” and “green” cone color blindness is similar. “Blue” cone color blindness is totally different, in fact it’s practically a 90-degree rotation of the other two making it impossible to follow a line that is maximally perceptible by everyone. Since the first two are similar and the prevalence of tritanopia and tritanomaly are considerably rarer compared to the other two, if we put tritanopia and tritanomaly aside (for now!) and design for the other two, we might be able to choose a single color spectrum that at least works reasonably well for those cases. A good color spectrum to use will be a vertical line that stays within the RGB boundary, either orange to blue or red to purple. That said, if we vary from the perpendiculars a little bit we might be able to satisfy everyone a little. Orange to turquoise and green to pink go diagonally across the color space and so might cover everyone. Finally, apparently everyone can see lightness, so the most accessible spectrum is just varying the lightness (and the color doesn’t matter). 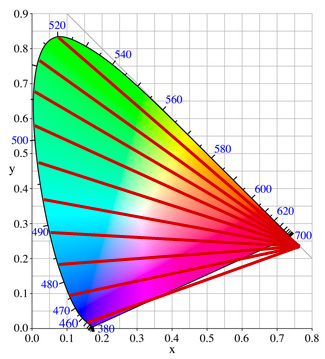 # of the color space is reduced, in CIE 1931 color space. # Draw the color space. # are just a translation and scaling of the LAB coordinates). # Convert this into sRGB so we can plot the color, and plot it. # Draw the confusion line or spectrum line gradient. # Compute pixel coordinate from grid coordinate. # Compute the CIE L*, a*, b* coordinates (easy). # Compute the corresponding CIE 1931 X, Y, Z coordinates. # and contour plots connect points of the same value. # the confusion lines. Then the gradient is plotted with the quiver plot type. for xi in xrange(0, csegs): # normalize!